Chocolate brown coloured diamonds were named “Cognac Diamonds” by executives at the Argyle mine as part of an advertising campaign. The purpose of the campaign was to raise awareness of the beauty of this colour of diamond. As the Argyle mine is the largest producer in the world of cognac diamonds, they hoped to increase sales too! Prior to this very clever marketing, the cognac diamond had been quite neglected, particularly in the world of fine jewellery. You can see that the Cognac name is quite appropriate, when you look at the dark, rich colour tones of these diamonds. They display deep burnt orange flashes of colour and chocolate tints and overtones. Cognac diamonds are truly one of the more stunning colours of all the fancy colour diamonds that are available. The cost of cognac diamonds compared to white diamonds is very attractive too. This opens up greater possibilities for the ring design. simply because not all of the budget is taken up with the central white diamond. Cognac diamonds look especially good when contrasted with white diamonds. The combination of the two colours really brings out the gorgeous, rich tones of the cognac colour. As you will spend less to get a great size cognac diamond, you may be able to also have more white diamonds set into the ring band as well. Have a look at the ring designs below to see just some of the possible options. Of course as we are custom ring makers, many of the ring designs you see on this site could be made with a cognac diamond, if that is what you want. Cognac diamonds are graded in clarity just like white diamonds. Due to their darker body colour, it is not really necessary to go to the extremely high clarity grades, which is a cost saving too. Although cognac diamonds can be certified it is more likely that cutters will not provide certification in diamonds of this colour unless they are quite large in size. What is most important in a cognac diamond, is its body colour, the way it refracts light, and its lustre. These are the things we look out for when selecting a cognac diamond for a client. Good diamond selection is critical to how the ring will look. A great looking diamond will carry the day in the ring, so it is important to get it right. You will not be looking at a “run of the mill” engagement ring with this diamond colour at its heart. Using a cognac diamond as the central stone is a fantastic way to achieve a very large, really stunning ring. If you want a unique custom made engagement ring at a great price, you should consider a fancy coloured diamond such as a cognac diamond. You can see more of these beautiful diamonds in our coloured stone ring pages. 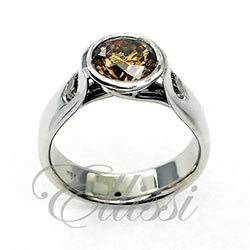 “Brandy” rich burnt orange Cognac diamond ring. “Bloom” Cognac diamond cluster ring. “Piani” Cognac diamond halo cluster ring.